Today was my Dad’s annual cider pressing. For at least 15 years we have pressed fresh cider using an old hand-operated cider press of my father’s that dates back to the late 1800’s. The apples are collected, washed and placed in bins to drain. Then they are poured into a hopper and crushed by turning a crank handle that spins an iron flywheel and operates the crusher. The crushed apples fall into an open barrel, and when that is full, it moves under the press.The screw press squeezes the apples and pure fresh juice flows from the press into a collecting pan. 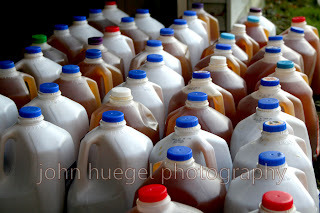 After a filtration step, the cider is blended and siphoned into clean gallon jugs. Over 100 gallons of cider was pressed today. There is nothing like the taste of fresh cider straight from this antique machine! A great dinner and lots of friendship and adventures for kids and adults alike makes for a great fall weekend experience. Thanks Dad and Linda for a great Cider Day! This entry was posted in Apples, Cider, Fall by admin. Bookmark the permalink.